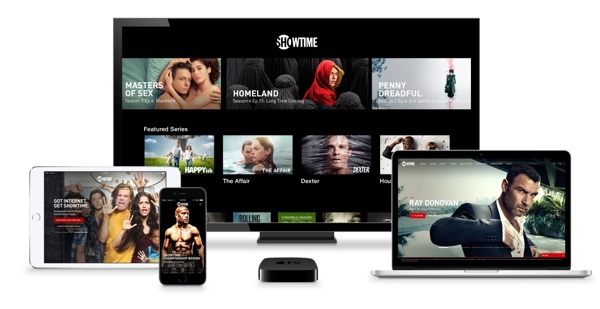 Streaming video is one thing the Apple TV does well, and those who like shows that belong under the Showtime banner will soon be able to watch its shows on iOS and Apple TV without the need for a cable subscription on July 12th. Apple may – or may not – be about to unveil a new Apple TV or media streaming deals at next week’s WWDC developer event, but that isn’t going to stop its media partners from cranking out new apps for its existing devices. Showtime, the people behind Ray Donovan amongst other high profile shows, has announced a subscription service that will allow anyone across the United States to watch its content without the need for a cable subscription. Simply called ‘Showtime,’ the new subscription will include live TV as well as a back catalog of content, meaning users will be able to watch such content on iPhones, iPads and Apple TV. Subscriptions to the service will cost $0.99 a month and are available to purchase via Apple’s App Store payment systems. In a statement on the new partnetship with Showtime, Apple’s SVP of Internet Software and Services said that “iPhone, iPad, iPod touch and Apple TV customers will now be able to subscribe to Showtime directly and instantly start viewing their favorite programming with the same simplicity as buying an app.” That simplicity will make it as easy as possible for customers to stump up the $10.99 required to get the service, while Showtime has confirmed that users will be able to take advantage of a free trial for a 30-day period assuming they sign up before the end of July. While Showtime is said to be on its way to more platforms soon, the timed exclusive to Apple – we don’t know how long that time period will be – again shows the strength of the Cupertino giant, its customer base and its app ecosystem. If the likes of HBO and Showtime are happy to launch apps and streaming services in this manner though, why can’t Apple put something a little more comprehensive together in order to truly take on the cable companies? It was only yesterday when National Geographic made its monumental debut on the Apple TV, and we’re certain the list will keep on growing as time moves on. Not sure if this is correct. That would be an awesome deal.